Every year our faculty represents Maastricht University in the annual international, inter-university simulation on the European Union, organised by TACEUSS Consortium, that brings together cca 200 students from European and American universities. These simulations have a specific theme related to the real-world policy agenda of the European Union. This year our team was representing Germany in the different EU bodies (European Council, GAC, the committees on budget & agriculture in the European Parliament) and negotiated the MFF (multi-annual financial framework). FASoS’ team was composed by second year students Sabrina Luh, Romane Dideberg and Dominik Schmidt, by third year students Jeanine de Bruin and Thierry Bleijswijk, by pre-master student Anna Marino and the coordinator Dr. Dorina Baltag. This simulation gave our students the unique opportunity to test their negotiations skills in a multicultural environment, to strengthen their political reporting and diplomacy skills and deepen their expertise on the topical issue of MFF. The success of our team was to bring home one of the 5 awards for best performing delegate at the EUROSIM 2019, awarded to Dominik Schmidt for his outstanding participation during the simulation. 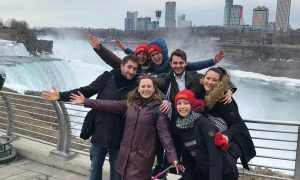 Besides involvement in the simulation itself, the host of the 2019 EuroSim organised an excursion to Niagara Falls, and the course coordinator organised a study visit to the EU Delegation to the UN and to the United Nations Headquarters in New York. The team wishes to thank the Programme Director of European Studies and the Faculty Board for the assistance provided and the financial support offered. The Eurosim 2019 team shares details of their experience on the Maastricht University EuroSim dedicated Facebook page.